Portland scored three runs in the top of the eighth to steal the game from Richmond. After three straight walks to start the inning, Luis Martinez and Jonathan Roof provided back-to-back singles to tie the game. Reed Gragnani's sacrifice fly put Portland up for good. Martinez finished the game 2 for 4 with three RBI. Madison Younginer earned his first save of the season with 1 2/3 innings of no-hit relief. Mike Augliera lasted six innings in a no-decision. He gave up four earned runs on five hits, while walking three and striking out none. A disastrous sixth inning did in Salem, as starter Kevin McAvoy melted down after a solid first five innings. He allowed two runs on five hits and struck out five in those first five frames, but then allowed a double and a two-run homer to start the sixth. McAvoy threw behind the head of the next batter he faced and was ejected. Chandler Shepherd did not fare any better in relief, allowing four more runs to score in the inning. Tzu-Wei Lin went 2 for 5 with two RBI and Manuel Margot went 1 for 4 and stole his 15th and 16th bases of the season. Greenville sent 14 men to the plate in an explosive, nine-run sixth inning that put the game well in hand. Rafael Devers had two singles and two RBI in that inning alone on a big day for the third baseman. Devers went 3 for 5 with two RBI and a run scored. Left fielder Mike Meyers went 2 for 4 with three RBI and one run scored. Yoan Moncada went 1 for 4 with a RBI. Seven different Drive hitters had at least one RBI on the game. Jalen Beeks was superb in six innings of work, allowing only two hits and no runs while striking out six and walking three. 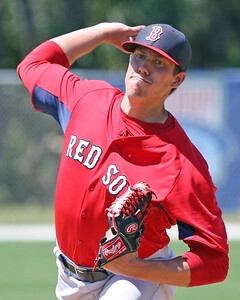 A pair of errors cost the DSL Red Sox1, as Christopher Acosta pitched 3 2/3 innings in his second start. The highly-regarded young righty allowed only one earned run on three hits, striking out three and walking one. Victor Familia pitched well in relief, striking out a pair and walking none in 3 1/3 innings. He did not allow an earned run. DSL hitters struggled against the Twins, collecting only three hits and striking out 12 times. Denyi Reyes was outstanding in his second start of the season, giving up just one unearned run in five innings of work. The 18-year-old righty scattered four hits, struck out seven and walked none. Jervis Torrealba earned a save with four innings of scoreless relief. Player of the Night: Pat Light caused quite a stir in his Triple-A debut, mowing down the three Toledo batters he faced. Tim Britton of the Providence Journal tweeted that Light not only hit 98 mph with his fastball, but mixed in his splitter at 89 mph. The 6-foot-5 Light had a 2.43 ERA with 32 strikeouts and 11 walks in 29 2/3 innings pitched for Portland, and opponents hit just .168 against him at the Double-A level.